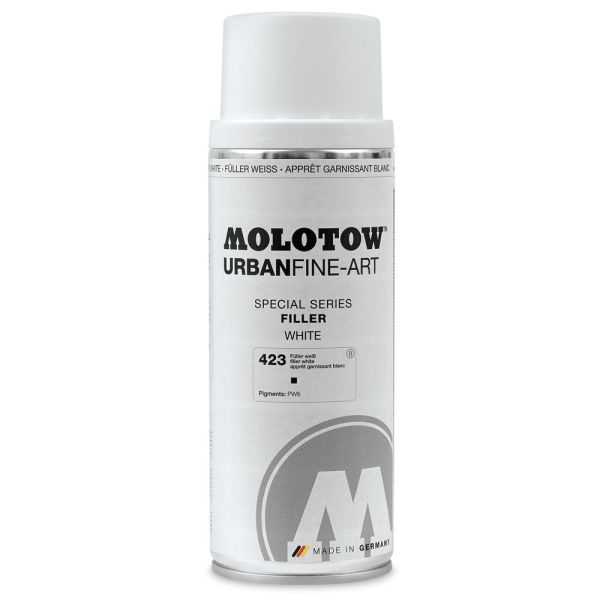 Molotow Urban Fine-Art Spray Filler creates the ideal ground for artwork made with the Molotow Urban Fine-Art system of interworking, professional-quality acrylic media (Molotow Artist Acrylic Spray Paint, Chalk Spray, and One4All Markers). Spray Filler is a highly pigmented, acrylic-based primer that adheres well to even the most tricky surfaces. Optimal surface coating may be achieved by applying several thin coats, and sanding between applications for an extra-smooth result. 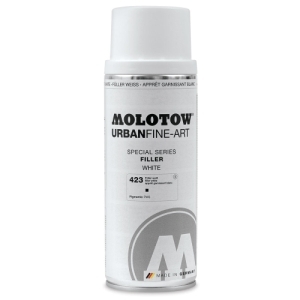 Molotow Spray Filler features Molotow's innovative, anti-drip, Flowmaster Vari-Valve, which guarantees controlled output and extra-smooth handling, even for inexperienced users. ™ Molotow is a trademark.™ Urban Fine-Art is a trademark. ™ Flowmaster is a trademark.